The Maltipoo is a fun-loving and popular dog breed! Below you will find a comprehensive guide for choosing the best dog food for Maltipoo breed. We’ll also cover nutrition as well as food recommendations for Maltipoo puppies, adults, seniors, and Maltipoos with food sensitivities or allergies. The Maltipoo (also know as the Moodle) is a cross between a poodle and a Maltese. Often, the cross is with a Toy Poodle and Maltese rather than a Standard Poodle. The Maltipoo is a toy dog and often weighs between 5 and 15 pounds, standing between 5 and 10 inches high at the shoulder. Maltipoos typically live to around 15 years of age. This fun loving dog comes in a variety of colors including, brown, white, cream, black, peach, fawn, and grey. Many Maltipoos are bi-colored and are a mix of white and another color. Additionally, their colors can change over time as they age. These special dogs are a popular dog breed for a variety of reasons. What’s nice is these are great dogs for novice owners and adapt well to apartment living. They have friendly, outgoing personalities and are typically very intelligent, making them easy to train. Additionally, they are great dogs for families and for people with allergies, since they are considered hypoallergenic. This brand features raw boosted kibble and freeze-dried raw chicken pieces mixed in. This kibble is high in protein and well balanced to meet your Maltipoos nutritional requirements. Many customers love to feed this product to their dogs. The raw boosts and pieces are desirable and delicious for your furry friend. The kibble is small in size and generally well liked, even by picky eaters. This product is 100% natural and provides wholesome nutrition for your Maltipoo. Wellness produces protein-rich kibble and boasts 80% more protein than traditional dog food brands. Wellness is loved by many customers, and there are a plenty of owners who swear by this brand. Customers love the simple and nutritious ingredient list as well as the variety of options for dogs of all ages and sizes. The grain-free small breed variety is a great option for your Maltipoo. Blue Buffalo products features an ancestral diet that is more similar to what a dog or wolf would be eating in the wild. The kibble is specially formulated with small dogs in mind. Additionally, Blue Buffalo contains small kibble pieces and LifeSource Bits that boost the immune system and deliver essential vitamins, minerals, and antioxidants. Blue Buffalo is highly rated, good quality, and fair priced. Customers enjoy the variety of kibble and wet food options as well as the wholesome ingredient list. Many Maltipoo owners report that this particular product helps with allergies and food sensitivities. This particular Maltipoo puppy food is specifically designed for small dogs. It contains wholesome, natural ingredients as well as added components to optimize growth and development. Nutro aims to have clean ingredients, so this brand has no genetically modified organisms, artificial colors or flavors, or artificial preservatives. This brand is top rated and works well for a large number of puppies. Customers love the wholesome ingredients and specially designed formula. This brand has everything you need for a young Maltipoo. This kibble is expertly formulated for small puppies under a year of age. 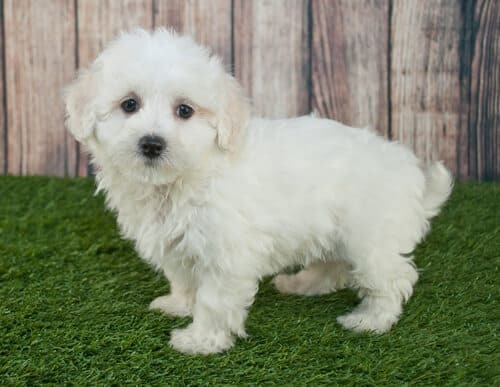 It is a great choice for your Maltipoo puppy since it will meet all their energy demands and support digestion, bone growth, and healthy development. Also, the small kibble size and appetizing mix of ingredients makes it a great choice. Royal Canin is a very reputable brand with high customer ratings. Although this food is a little more expensive than other products, this kibble is specifically designed to meet all the nutrition requirements for small breed puppies. Blue Buffalo sports a simple and natural ingredient list along with their patented LifeSource Bits. This particular variety is great for senior Maltipoos, but Blue Buffalo has an extensive range of kibble and wet food options for dogs of all breeds, sizes, and ages. Overall, Blue Buffalo is highly rated. Consumers report that this kibble is easy to eat and digest for older small breed dogs. This is an excellent quality kibble for a great price. This product is specifically designed for small breed dogs with sensitive stomachs. This dog food is made in the USA with high-quality ingredients. The kibble is formulated to help dogs with both skin problems, digestive issues, and allergies. It also features a 100% money back guarantee if the food does not work out for your dog. This product comes highly rated! Owners and small dogs alike seem to really enjoy this food. Many customers report that this particular Hill’s formula helped their small breed dog like Maltipoos with skin issues, digestive upset, and allergies. The Maltipoo has similar nutritional requirements as other toy dogs. Dogs of all breeds require balanced and complete nutrition. Although all pet foods are designed to meet these requirements, it is generally recommended that you feed your Maltipoo a brand specifically designed for small dogs. Small dogs need more calories per pound than larger dog breeds. This is because small dogs have higher metabolic rates than larger breeds. Maltipoos, similar to other toy breeds, require a smaller kibble size. Although they can eat larger kibble pieces, it is easier for them to chew and digest smaller pieces. There are certain steps to take in order to properly feed your Maltipoo. Always feed them the recommended amount for their weight and age. Although it might be tempting, do not over-feed your Maltipoo, and limit the number and size of treats that you give them. It is recommended that you feed your adult Maltipoo two small meals a day. Puppies should have more frequent meals, up to five times a day. It is best not to free feed your dog since this can lead to weight gain. Additionally, feed your Maltipoo high-quality brands, and never abruptly change the type of food or this could lead to digestive upset. 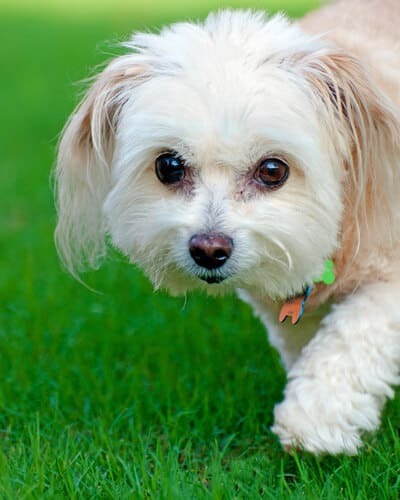 The Maltipoo faces many of the same health concerns as the Poodle and Maltese. Poodles are known for having sensitive stomachs, so it might be in your best interest to try grain free or limited ingredient food varieties. Additionally, many small dogs are at risk for developing dental problems due to their small mouth size. Make sure you have regular dental checks by your vet. You can also use tartar removing treats or brush you Maltipoo’s teeth. High quality kibble or dry dog food will also help remove tartar and plaque buildup from your dog’s teeth. Small dogs are also at risk for developing diabetes and obesity. Diabetes can occur since small dogs have a harder time maintaining sugar levels. Therefore, choose a food that does not have added sugar. Obesity can occur if you over-feed your Maltipoo. Small dogs put on weight quickly and easily, so make sure to feed your Maltipoo the recommended amount and ensure they get plenty of exercise. It is important to ensure that your Maltipoo’s food meets the entirety of their nutritional requirements. Because of this, there are certain must-have ingredients and others to avoid. Below are some things to know about pet foods and the necessary ingredients for your Maltipoo. Similar to human food, pet foods are regulated by the Food and Drug Administration (FDA). This means that pet food companies are legally required to list every ingredient on their food label along with a guaranteed analysis of the components. Additionally, there is a daily guideline for the amount of food to feed your pet based on weight. Another thing to remember is that commercially produced pet foods are required to be nutritionally balanced for all life stages. This ensures that the food meets all the requirements for protein, carbohydrates, amino acids, fats, fiber, vitamins, and minerals. However, there are still some ingredients that are better than others. hese can include meat, dairy, eggs, and seafood, and protein should be one of the first things on the label. Other things to look for include fat, calcium, carbohydrates, and essential fatty acids. Health trends point to organic dog food and homemade dog food as great alternatives to traditional dog food. Unlike human food, pet food is usually produced under lower standards. The majority of pet food is produced as feed-grade instead of human-grade. However, there are plenty of high-quality brands on the market. To determine high-quality pet food, there are certain ingredients to avoid for any dog breed, including the Maltipoo. First, stay away from brands that list byproducts or rendered fat in their ingredients. Byproducts can include either meat or grain meal byproducts and are not quality sources of protein or carbohydrates. Rendered fat is usually added to enhance flavor of kibble. However, rendered fat can be a source of microbial contamination and toxins, especially if the pet food bad is not sealed correctly or the food is exposed to moisture. Another component to avoid are dangerous chemicals and preservatives. Specifically, Butylated Hydroxyanisole (BHA), Butylated Hydroxytoluene (BHT), and Ethoxyquin might be harmful to your pet. BHT and BHA are chemicals added to fats and work as preservatives. However, both of these compounds have been shown to have carcinogenic effects. Ethoxyquin is another preservative chemical, and it is currently banned from being added to human food. However, it is still allowed in pet foods. It often used in conjunction with fish meal. Human safety data reports that Ethoxyquin can be harmful if swallowed or if there is skin contact. In general, it is best to avoid food with artificial preservatives. However, there are natural preservatives such as Vitamin C and Vitamin E that are a better alternative. Finally, make sure that the food for your Maltipoo avoids artificial colors and dyes. In reality, your dog does not care about artificial coloring, and these ingredients are used for human appeal. Artificial coloring components such as Red 40, Blue 2, Yellow 5, and Yellow 6 have been linked with food hypersensitivity, allergic reactions, behavior problems, and cancer in humans. Additionally, caramel color has come into the spotlight recently as potentially harmful. This is due to the fact that it contains the know animal carcinogen 4-methylimidazole (4-MIE). Finding the best dog food for Maltipoo can be a trying process, especially if they are picky eaters or have digestive issues. In general, look for easy to read pet food labels with natural ingredients. Many dogs with food sensitivities and allergies prefer foods that contain a single protein and single starch source. If you ever need help finding the proper food for your Maltipoo, consult your veterinarian or an animal nutritionist.